Welcome to the Business Intelligence User Group of Nashville. Our goal is to build a community of data loving individuals so that we can share experiences and help each other learn. We are an official PASS chapter. Stay tuned as we grow this community together. Your collective team of passionate data professionals. Our group is proud to be affiliated with the Professional Association for SQL Server, a world-wide SQL Server User Group. PASS is dedicated to providing unsurpassed SQL Server education and networking opportunities for SQL Server professionals around the world. 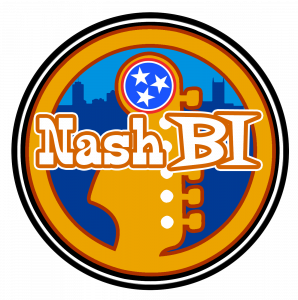 Nash BI is part of the Microsoft Power BI User Group Program. Microsoft is not responsible for content on this website or activities that take place at Group meetings.